First let me say that if you don't have roosters you'll probably be amused by this post. If you do have roosters, you'll be happy that someone else is sympathetic to your plight! lol I think just about everyone who met a rooster for the first time was surprised to hear him crow in the middle of the day because as city slickers we are conditioned to think roosters only crow at sun-up. Every day. Coffee commercials start with a sunrise and rooster crow. Farm movies do the same. When you don't actually live on a farm, you tend to believe these stereotypes. Then you get your first rooster and cold hard reality sets in. The crow A LOT....and all day long! In fact, if you have more then one rooster, they get into crowing contests! First one rooster crows then another feels the need to respond. The next rooster crows and suddenly the first rooster needs to 'holla back' and next thing you know it's 10 minutes later and your looking for ear plugs! Ear plugs probably won't work but you can get a free pair if you want to give it a try. Actually...nothing will work! lol Sad but true. Roosters can't be stopped once they start a crowing contest but they can be started! Just about anything can trigger them: a phone ringing, a car arriving, the dog barking, a clock chiming, the doorbell, a horn, another rooster, a text message alert and the list goes on and on! A rooster can only crow when his neck is fully extended. They do this 'roll their eyes back in their heads' thing that is only slightly creepy. Actually, they close their third eyelid when they crow which only gives the appearance of the eye roll. Still slightly creepy. The fear of chickens is called Alektorophobia. We refer to the fear of roosters as: Spurrophobia as in "I'm afraid of those big spurs digging into my legs!" Kidding! Some roosters bite instead of spur. Ok, only that fluffy rust colored rooster in the picture does it....but come on, he can't really be the only one! Other roosters will simply chest bump your leg when they want to bully you. Try not to laugh if it's a bantam. He thinks he's tough! 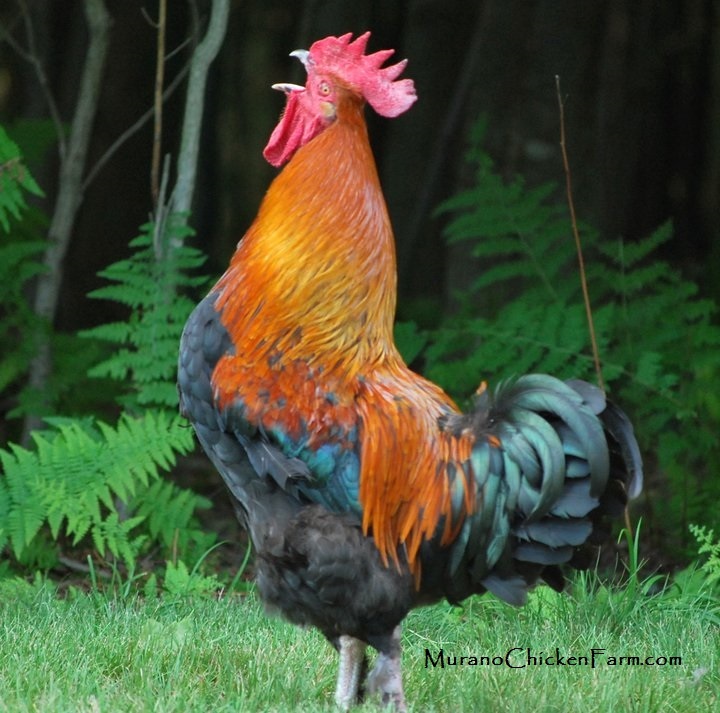 Roosters have several different vocalizations. They have a clucking sound that says "come here hens, I found a treat" They growl at other roosters to threaten them, or keep them in line. They have warning sounds they make when they want to warn the flock of a hawk or other predator nearby. They also have their Velociraptor impression, but you really have to see that one to believe it! The rooster is part of the Chinese zodiac. The last 'Year of the Rooster' was in 2005, the next will be in 2017. Those born in the year of the rooster are believed to be honest, ambitious, sharp dressers and quick minded. Many suburban areas that allow hens don't allow roosters because of the noise. ...and last but not least, a rooster crowing in the country is like living next to the neighbor with the touchy car alarm in the city. You really do start to tune it out after awhile. I love the sound of a rooster crowing. It let's me know I am at home amidst the animals, and that I'm at home! I think it so cute to watch them muster up the best crow they can. So fun! Exactly! It's really funny when the tiniest banty's do it. It takes so much effort for such a little guy. SO cute! This made me laugh this morning! We shared with our FB/Twitter readers at homesteadlady.com. Glad you got a chuckle from it! Thanks for sharing the post....I really appreciate it! Our rooster starts about 3 AM but we're so used to it that we do not hardly hear it anymore although when he crows A LOT, repeatedly, I do stick my head out just to make sure nothing's up that I need to be concerned with. The eye rolly thing is sort of strange. I was born in the year of the Rooster! Does that make me special? Haha I love hearing roosters crow, but only two of them. Three is a crowd - too noisy! Loved your post! I have about 5 beautiful roosters among my 15 hens.When they start crowing at 3 am I feel happy, because thats my way of getting even with the lazy neighbours that like to play disgusting hip hop from their car stereo loud. Perfect retaliation! I got a good chuckle out of this!